Oh Cinque Terre, you didn’t let me down! Even though it drizzled when I arrived to Riomaggiore it was as lovely as I expected. I didn’t know what to expect from Manarola but it really blew my mind with its beauty! One of the places I’ve had on my never ending bucket list was Cinque Terre and especially the villages of Riomaggiore and Manarola. I’d seen many amazing photos of these cute villages that I felt like I must see them too. And I’m so glad I got to visit them on my road trip. I only had one day of time for these villages which in hindsight wasn’t enough. The streets of Riomaggiore were beautiful in color! The road to Riomaggiore from La Spezia is amazingly curvy. The sharp turns lead you up to the mountain and when you arrive to the coast there will be a spectacular views to the sea. The car park for a day was around 20 euros in a parking garage. If you don’t have a car you can get to Riomaggiore and to Manarola also by train. Riomaggiore looked as the older one one out of these two villages. It felt like the building were more worn than in Manarola and that the buildings have had a hard time with sun and moisture. But they are still very beautiful if you ask me! There is only one main road that goes down the hill up to the small harbour. The harbour is the main place where all visitors go and take some photos so be prepared for crowds during summer months. The colorful buildings of Riomaggiore village in Cinque Terre! I’ve heard there is a nice restaurant facing the sea next to the harbour but unfortunately it wasn’t open by the time I visited Riomaggiore. I ate in a restaurant along the main alley and the food tasted excellent. I took a pizza called “Riomaggiore”. I guess that name was just for the tourists but I really enjoyed my pizza haha. From Riomaggiore I continued to Manarola. I wish I had had more time to spent there since the sun already started setting by the time I arrived there. It was perfect time to get some good photos though! Manarola seemed to be the newer village of those two and the buildings were in good condition. Actually I even prefer now Manarola over Riomaggiore which I didn’t know could happen. Manarola had similar curvy street going downhill like Riomaggiore. The viewpoint over the village is easier to go to than Riomaggiore’s if you ask me and there were a lot less people. I could have spent there the whole day! In Manarola I really enjoyed the chilled atmosphere. The restaurants were very inviting and people didn’t have any rush to anywhere. There were quite a lot of people swimming by the time I went there and I felt that I could have really spent a day or two in that lovely village. 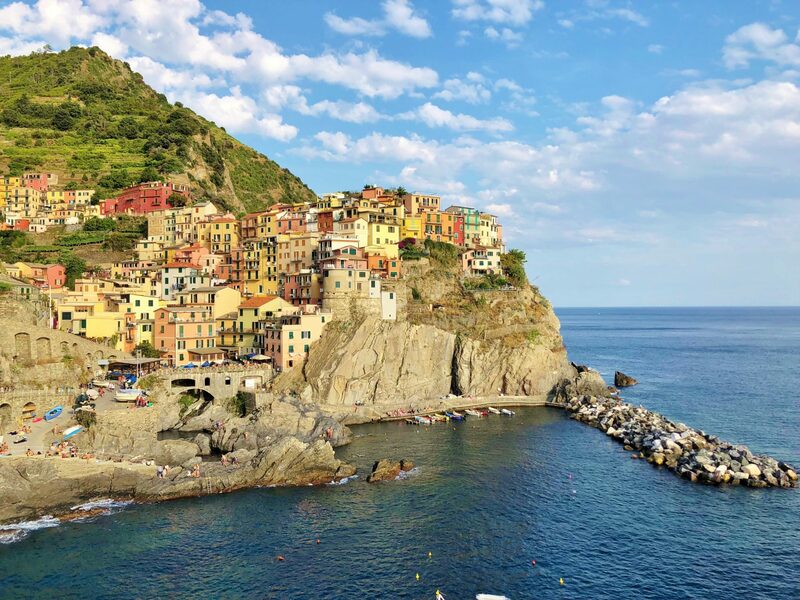 Riomaggiore is worth the visit but Manarola is the place to get mesmerized! Cannot take my eyes off this beautiful Manarola village! Looking for other places to visit in Italy?